A grant deed can be used to convey real property in Mississippi. In a conveyance of real estate in this state, the use of the words "grant, bargain, and sell" will operate as an express covenant to the grantee, his heirs, and assigns, that the grantee was seized of an indefeasible estate, free from encumbrances made or suffered by the grantor, except the rents and services that may be reserved, and also for quiet enjoyment against the grantor, his heirs, and assigns, unless limited by specific words contained in the deed ( 89-1-41). 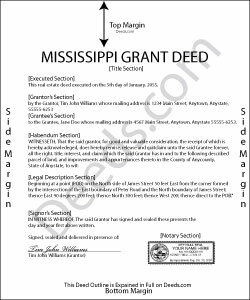 A grant deed in Mississippi is required to be declared in writing, signed by the grantor, and delivered ( 89-1-3). Grant deeds should be acknowledged or proved in order to entitle them to be recorded, and such acknowledgment or proof should be certified by an officer authorized to take acknowledgments. Any of the officers listed in section 89-3-3 of the Mississippi Revised Code are authorized to acknowledge or prove deeds. If the party executing a grant deed or other conveyance does not reside in Mississippi, the deed can be acknowledged or proved by any of the officers listed in 89-3-9, and the instrument will be as good and effectual as if the certificate of acknowledgment or proof had been made by an authorized officer in Mississippi ( 89-3-9). Grant deeds lacking a proper acknowledgment or proof may be refused for record by the clerk. However, if an instrument is not acknowledged or proved according to law but is otherwise admitted to record, then all persons are considered to be on constructive notice of the instrument ( 89-3-1). The recording of a grant deed in Mississippi is essential in order to provide notice to third parties. Except as may be provided by Mississippi laws, a grant deed or other conveyance is invalid as against a purchaser for valuable consideration without notice, or any creditor, unless the deed has been recorded with the clerk of the chancery court in the county where the real property is located. After the deed has been filed with the clerk, the priority of the filing time will determine the priority of all conveyances of the same land as between the several holders of such conveyances ( 89-5-1). If a grant deed is not filed for record with the clerk, the failure to do so will prevent any claim of priority by the holder of such instrument over any similar recorded instrument affecting the same property, to the end that with reference to all instruments which may be filed for record, the priority thereof is governed by the priority of the filing time of the several instruments, in the absence of actual notice. A grant deed will take effect, as to all creditors and subsequent purchasers for a valuable consideration without notice only from the time it is delivered to the clerk to be recorded ( 89-5-5). An unrecorded grant deed will be valid and binding only between the parties and their heirs, and as to all subsequent purchasers with notice or without valuable consideration ( 89-5-3).